Michael R. Vogt is a member of the Real Estate Group in Dykema's Bloomfield Hills, Michigan office. Mr. Vogt’s practice involves all aspects of real estate litigation, including land use and zoning, eminent domain, landlord/tenant, commercial foreclosures, and a variety of business disputes related to the purchase, sale, leasing, and management of commercial real estate. He also frequently represents telecommunications companies, both at the municipal level to secure zoning approvals for the construction or collocation of new wireless communication towers, and in litigation/ADR related to zoning or commercial disputes. 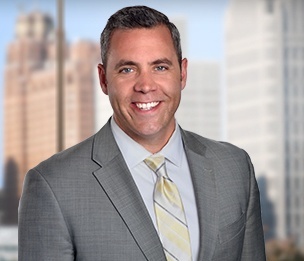 In addition to his real estate practice, he also has significant experience representing lenders in contractual claims against borrowers and guarantors in courts throughout Michigan, as well as representing judgment creditors in post-judgment collection actions. While in law school, he clerked for the Honorable Lisa Gorcyca, 6th Circuit Court, Oakland County Michigan. Prior to attending law school, he served as a legislative aide to State Representative David Law in the Michigan House of Representatives. Mr. Vogt graduated from the John Marshall Law School where he was twice named to the Dean's List and was a CALI Award recipient for Real Estate Transactions. Representation of owners, property managers, landlords, and tenants in commercial lease disputes involving all types of commercial uses, including office, restaurant, big-box retail, industrial, religious, and parking garage. Mr. Vogt has extensive experience litigating complex lease disputes for both landlords and tenants, including numerous bifurcated cases involving both eviction procedures (in Michigan District Court) and high-exposure claims for damages (in Michigan Circuit Court or Federal District Court). Defended an office tenant in a Circuit Court lawsuit and obtained summary disposition of the landlord’s claim seeking nearly $100,000 in alleged maintenance charges. Commenced a federal lawsuit on behalf of an international telecommunications company seeking damages for a tenant’s breach of seventeen tower lease agreements and, through meditation, obtained a large six-figure settlement. Defended a national restaurant chain in an eviction lawsuit seeking $100,000 in unpaid rent and obtained a favorable settlement which included full forgiveness of the past-due rent and a lease amendment that saved our client $1,000,000 over the term of the lease. Successfully represented a large Detroit-based non-profit agency before the Detroit Zoning Board of Appeals (and Wayne County Circuit Court in related appeal) in its opposition to the construction of a concrete-crushing facility on an adjacent parcel. Defended a school district (landlord) in a Circuit Court lawsuit and obtained summary disposition of the tenant’s claim that the school district breach of the lease and option to purchase.